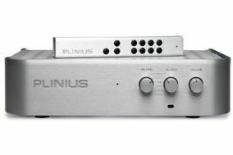 Plinius 9200 review | What Hi-Fi? There's very little else for this money that comes close to the 9200. Plinius is a name still barely known in the UK. That's a real shame because this New Zealand-based electronics manufacturer has been established since 1980, and judging by the M8/P10 pre/power we reviewed back in our September 2007 issue, and this integrated amp, the company makes some of the best hi-fi around. For example, most rival manufacturers make do with cheap, plastic, off-the-shelf remote controls that look and feel no better than those found on a supermarket-special DVD player. Plinius, in contrast, has gone to the trouble of making a chunky, metal design that looks great and is very easy to use. The remote from the matching CD-101 CD player will control this amp's volume, too. The 9200 integrated amplifier is right on message. It's easy to use while having enough features to keep most purists happy. There are plenty of inputs, even a phono stage, and the option of both balanced and unbalanced connections. A power output of 200 watts per channel means this amplifier will be happy driving most price-compatible speakers to decent levels even in large rooms. Not something that can always be said about lower-powered alternatives. Outwardly, there's little about this amplifier that suggests any thing beyond the norm at this kind of price level. Start listening, though, and we doubt you'll want to stop.